Electro-Max, Inc. will now offer abrasive blasting services for small stainless steel component parts up to 24″ in length and width. We currently offer a variety of surface finishing services such as pickling, passivation and electropolishing but no other complimentary services such as blasting. Many of our customers in the nuclear, medical and food industries send their parts to many vendors to reach an end point. We are trying to lessen the time your parts spend in transit and also save on shipping and labor costs associated with managing several different suppliers or vendors. We provide a range of surface preparation methods such as pickling, passivation and electropolishing but now we offer abrasive blasting services for small components made of stainless steel. We are looking to expand into other alloys as we move forward. 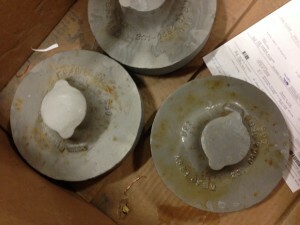 Electro-Max will offer aluminum oxide media blasting for stainless steel components at this time. 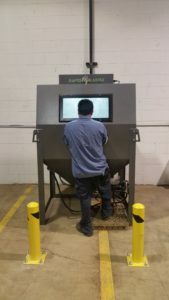 Grit blasting provides an economical choice that is used to remove any foreign material such as scale, oxides and other contaminants that may be left on your part after manufacturing or the machining process. Abrasive media blasting is a process that provides a matte surface finish without any substrate material removal or chemical contamination. After being blasted to remove all foreign bodies our passivation service removes any residual film left over from the process and seals the surface of stainless steel back up creating a corrosion resistant layer that will hold up in even the toughest of conditions. Many of our current customers are sending their parts elsewhere to be blasted so we have added this as a service extension to what we already do here at EMI. Our turnaround time is 3-5 days with expedited services available. Electro-Max, Inc. will provide free samples for your approval to ensure we meet your expectations. EMI specializes in metal finishing of stainless steel. Electropolishing at EMI can provide a chrome like appearance through micropolishing. This type of finish is not done by buffing and is superior to any final process that can be done to stainless steel.